Complete the information below and we will contact you to discuss your challenges, needs, goals, and our high ROI solutions. 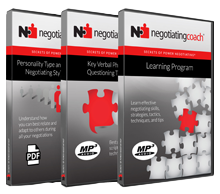 negotiatingcoach.com® is an international negotiation training, consulting, and coaching firm that specializes in teaching negotiating skills and the decision-making dynamics that affect negotiation outcomes. Since 1995, we have been a proven solution provider and the benchmark for providing high return- on-investment negotiation solutions, ranging from our negotiation training programs to complex organization-wide negotiation initiatives. Offering more than 25 years of successful negotiating experience and expertise in sales, marketing, purchasing, distribution, and consulting – from small business to multinational corporations, from personal transactions to multimillion-dollar extended supply agreements and contracts – negotiatingcoach.com® has added hundreds of millions of dollars to its clients’ collective bottom line through effective training, consulting, coaching, and negotiation facilitation. Michael is a recognized negotiating expert and highly regarded professional speaker who consistently wins rave reviews from attendees for his ability to deliver impactful, thought-provoking, engaging, and challenging presentations to corporations and associations around the world. Don’t have the time or budget to attend a seminar and need to improve your negotiating skills? Then our NEW Audio Learning Program is the ideal solution for you! Order from our online shop. ® Negotiating Coach, negotiatingcoach.com, the negotiatingcoach.com logo unit, Forensic Selling, and Secrets of Power Negotiating are all registered trademarks of Selling Solutions Inc.
All client logos used on this website are property of their respective owners.